Learn how to make a Ravenclaw robe with this simple tutorial. This method is so easy that it is ideal for those new to sewing. Perfect for a Luna Lovegood costume. A length of black fabric matching the measurements in Step 2. For a lined robe: A length of fabric the same size as your outer fabric. This should be dark blue for Ravenclaw house. Once you have gathered your materials, we can get started. Measure from your shoulder to your ankle. If you want the robe to be shorter than ankle length, measure to your knees or calf. Measure from wrist to wrist to determine how long you want the sleeves of your robe. If you want the sleeves to overlap your hands, then add a few inches to the measurement. Cut a rectangle of the black fabric that is twice the length of your shoulder to ankle measurement. Now cut an identical rectangle from the blue fabric. Fold the black fabric exactly in half. Make sure that all the sides are lined up. Lay down with your shoulders at the top of the fabric and spread your arms out as shown. Spread your feet about a foot and a half apart. You'll need a buddy to trace the shape of the robe around your body. For a billowing robe, trace farther from the body. For a robe that has a better fit, trace 5" or so away from the body. For the sleeves, start 8" from the top of the fabric for a close fit. Trace 14" or more for long, draping sleeves. Once you have made your marks, go back and adjust your lines to make sure the measurements are even. If one sleeve is 18", make sure both sleeves are 18" and so on. Cut through both layers of the black fabric, making sure that the bottom layer doesn't bunch or shift while you're cutting. Don't cut the top of the fabric where it is folded. Open up the black robe cut-out and lay it on top of the blue fabric. For a lined robe, you will need to trace the cut-out robe on the blue fabric to make a perfect match. Cut out the identical blue robe. Fold the black fabric so that it is inside-out. Use your sewing machine or hand sew a straight stitch along bottoms of the sleeves and the sides of the robe. Use about a 1/4" seam allowance. Zigzag stitch the raw edges to prevent them from fraying. Use your measuring tape to find the exact center of the robe and mark it. Cut all the way up through the front of the robe. Do not cut through both layers. Repeat this step with the blue fabric. This may seem like a trivial step, but it is going to really save to time and hassle while you are sewing ​and makes the finished product look much better. Use your steam iron to press the raw edges of the cuffs, bottom hems and front openings of the black and blue robes. You will need to fold in about 1/2". Once your edges are ready, you can sew the lining to the outer robe. Turn the blue lining robe inside out. Insert the blue robe into the black robe, making sure that the seams line up and that the sleeves are not twisted. Line up the pressed edges of the cuffs, bottom hem, and front opening. Pin in place. Once you have it in place, then you can top stitch the robes together. Stitch the lining in place. Now you will stitch right through the top of the black robe to secure the blue lining in place. Stitch along the cuffs, then the front opening, and finally the bottom hem. If you pressed your edges, this step should be very easy to complete. Once your robe is put together, you can add a Ravenclaw iron-on patch to the front, or even tack a few buttons on the front. 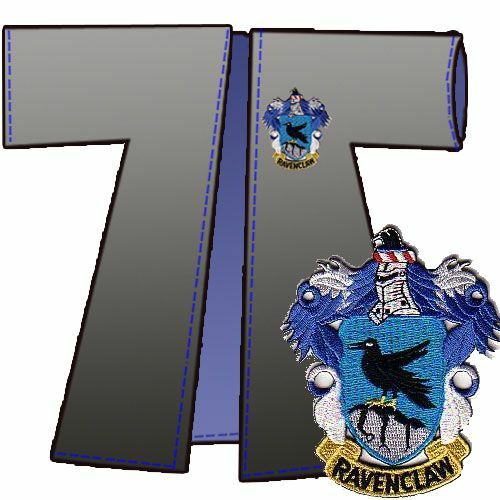 Now you can make a Ravenclaw scarf to go with your new robe.